On this date in 1936, the Spanish Republicans shot Don José Antonio Primo de Rivera y Sáenz de Heredia, 1st Duke of Primo de Rivera, 3rd Marquis of Estella, Grandee of Spain. The son of Spain’s 1920s dictator, Primo de Rivera founded in 1933 the Falange, Spain’s native fascist movement. Primo de Rivera espoused for Falangismo the same impulses — of unity, of destiny, of national rebirth, of the triumphant collective — that animated Europe’s similar extreme right stirrings in those years. Only 35 years before, Spain had lost her empire, near enough in memory to inform an acute ache of loss. In a poetic sweep we will raise this fervent devotion to Spain; we will make sacrifices, we will renounce the easy life and we will triumph, a triumph that — you know this well — we shall not obtain in the upcoming elections. In these elections vote the lesser evil. But your Spain will not be born out of them, nor does our frame for action reside there. That is a murky atmosphere, spent, like a tavern’s after a night of dissipation. Our station is not there. I am a candidate, yes, but I take part in these elections without faith or respect. And I say this now, when so doing may cost me every vote. I couldn’t care less. We are not going to squabble with the establishment over the unsavory left-overs of a soiled banquet. Our station is outside though we may provisionally pass by the other one. Our place is out in the clear air, beneath a moonlit sky, cradling a rifle, and the stars overhead. Let the others party on. We stand outside vigilant; earnest and self-confident we divine the sunrise in the joy of our hearts. Primo de Rivera’s share in this alliance was a voluptuous cult of personality as Spain’s preeminent right-wing martyr, fine posthumous work if you can get it mitigated only by the necessity of undergoing the martyrdom. The fascist prophet was already in prison at the time Franco struck the first blow of the war: he’d been arrested in Madrid on weapons charges. From his cell he carried on a brazen correspondence with Nationalists conniving to subvert the hated Spanish Republic, and when his activities were discovered and prosecuted that autumn in light of Franco’s July revolt they could scarcely have been better framed to incur the utmost measure of judicial wrath. In consequence of his martyrdom, November 20 remains down to the present a hallowed day for the far right in Spain. “Cara al Sol” (“Facing the Sun”) is the Falangist anthem; the lyrics are generally credited to Primo de Rivera. 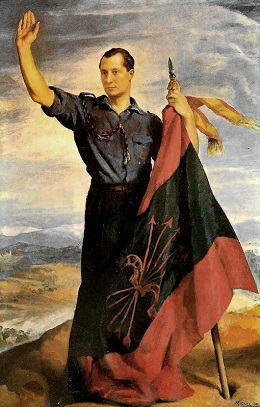 * The Falange Española Tradicionalista y de las Juntas de Ofensiva Nacional-Sindicalista, or “Spanish Traditionalist Phalanx of the Assemblies of National-Syndicalist Offensive” (FET y de las JONS) — or less exhaustingly, the Movimiento Nacional (National Movement). ** Primo de Rivera and Franco didn’t like each other much personally, either. I wonder if the conflict with Franco had anything to do with Franco’s (part) Jewish ancestry?